One of the best romances ever made. Rick Blaine is happy living his life in Casablanca, Morocco. He runs the most popular joint in town that serves people on their way out of occupied France and into Lisbon. When the leader of the French resistance, Victor Laslow, and his wife, Ilsa, arrive at Rick's Cafe his life is turned upside down. It seems that before Rick fled Paris he and Ilsa shared a romance. While he has turned off his emotions and managed to get on with his life seeing her again opens old wounds. As the flame between Ilsa and Rick begins to reignite Victor is in danger. The German soldiers believe he murdered two of their own and are after him. Now Rick must decide if he escapes with Ilsa or allow her to leave with her husband. This is without a doubt one of the best films ever made. 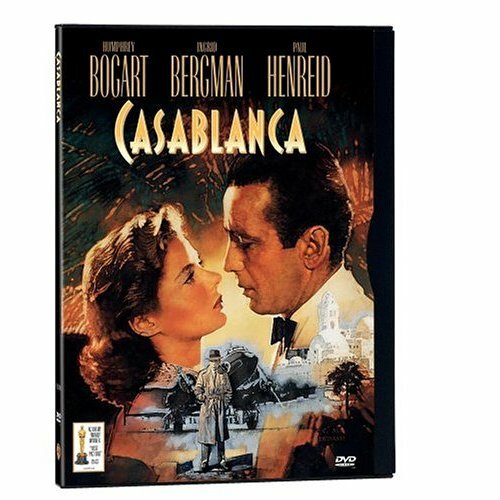 Humphrey Bogart and Ingrid Bergman are at their best as the torn lovers Rick and Ilsa. The scene that has been dubbed the dueling anthems is the turning point of the film and is one of the best scenes in the movie. Any movie lover needs to see this movie.